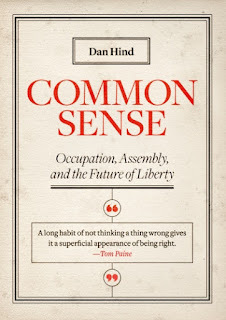 Ebook Review: Dan Hind's "Common Sense: Occupation, Assembly, and the Future of Liberty"
Home » activism » ebooks » occupy » review » Ebook Review: Dan Hind's "Common Sense: Occupation, Assembly, and the Future of Liberty"
The organization of prestige found in the political class, in the media, and in academia is now indefensible. The bankruptcy of the Western economies is mirrored by an intellectual bankruptcy that those who currently hold power cannot adequately acknowledge. The triumph of the market faith was so complete that there is hardly anyone with public status who can afford to state openly what is obviously the case: the promoters of the old, exploded common sense – including its many tame experts – are ridiculous. So the show continues, as though they are not. This is the stuff from which revolutions are made. But if we can no longer leave the market or the expert to secure the general interest, we are left with only one other means. It is not mentioned on the evening news. Indeed, as far as the mainstream of political comment is concerned, it does not exist. Our last hope is everywhere and everywhere it is overlooked. This is the first ebook I have actually paid for, and it was very much an impulse buy because I was interested in what people are writing about Occupy. I have blogged quite a bit about my experience of the Occupy movement, and it's easy to lose sight of what appealed in the first place, namely that forum for open debate, and the desperate need to feel as though we were doing something about a system that is disgustingly unfair. Dan Hind tracks the political history of the West in terms of the growth of the myth of the 'Free Market' and of the ever more deeply ingrained notion that we must leave our governing to the 'experts'. In a clear and concise way, Hind outlines the processes through which our idea of common sense has been constructed by the media machine, and those in power. As he rightly points out, in the past man believed the earth was flat. This was an undeniable fact. This is a very simple example, but it nevertheless highlights the fact that truths and our idea of truth, changes. At first, this book made me angry because I felt frustrated by the unfairness of our corrupt state (described so well in the opening chapter), something that was brought home to many of us as the financial crisis came to a head. However, as I read on, I realised this was not a piece aimed to be defeatist. This was no mere exercise in self-indulgence. This man has something to say. He reminded me of the potential for political freedom brought about by the many Occupations, in all their various forms. Hind writes of Occupy as a way of participating in government, and thereby overthrowing the myth that politics should be left to experts who have proven themselves incapable and corrupt. I found the persistent media misrepresentation of Occupy to be one of the most frustrating aspects of the process. Here we were, people from all walks of life, gathering to discuss. And yes, that does lead to disagreement and can lead to tension, but there is a buzz from real exchange. Yet we were persistently painted in the most unflattering terms. For me, it was a real turning point in terms of my news ingestion. I am particularly wary of all mainstream news reporting, and probably a little paranoid about all we're not hearing, as a consequence. It's difficult to review a political piece without getting carried away with the ideas, and yes, I do agree with much of what Hind writes. However, I also found it to be an accessible text for someone unaccustomed to reading such work, and I would thoroughly recommend your reading it. It's only fifty pages, and if you get as engrossed as me, you'll dash through it in an hour or so. This new pamphlet by Hind is an enlightening reminder of the importance of Occupation, and its potential to provoke real change through a renewed engagement with a political life. However, the emphasis is on the 'we'.